Living in two worlds can require a lot of explaining. When poets and poetry aficionados ask me what I do for a living, I usually just say, "technology." Often, that one word is enough to make them change the subject. Most people don't want to know the details once I utter the t-word. You'd think I worked in a slaughterhouse. But even for the tech-savvy, an elevator pitch or traditional resume doesn't really begin to tell the full story of what I do. That's why, when I discovered VisualCV through Guy Kawasaki's blog some months ago, it seemed like the perfect way to explain what I do, in a more rich and compelling way, to technologists and poets alike. I added screenshots of websites, narratives with hyperlinks, technical articles, and video to my VisualCV page using their super-easy, web-based interface. Then, I posted a link to my VisualCV page in the community forums, thus entering myself in to the VisualCV best resume contest. A few weeks later, I got notice that I made the finals. My wife, Valerie, whose career story is equally complex and compelling, actually did as well. They generously issued Amazon gift certificates to both of us. I used mine to buy books for my final semester of the MFA. Then, a few weeks later, during my fourth MFA residency, I got notice that I won one of the grand prizes for best resume. How cool is that? My prize, an 8GB iPod Touch, arrived yesterday. It's basically all the fun of an iPhone without those annoying cell phone features. I have nicknamed it the iFaux. Say it fast, while holding it up to your ear, and nobody will know the difference. Categories: Life. 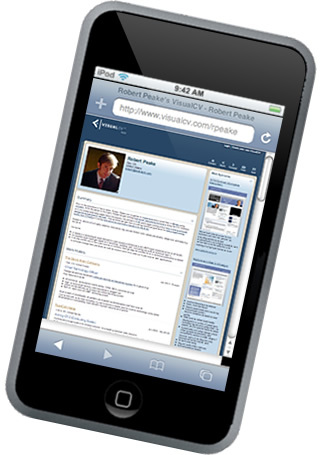 Tags: IPod, Mobile Web, and VisualCV.